The Story: As a youth, you heard the stories of the brutal Cadet training programs, but still you yearned to join. Underage and excitied, you falsified your age to join the Cadet ranks. Now, after watching your comrades drop off one by one, it’s your turn… Will you survive the Simulation and earn your training certificate? 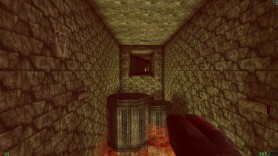 Gameplay: This is a non-combat map, where weapons are used to open doors. Your enemy is time, as in most parts of the map your health will steadily diminish. I strongly reccommend that you reduce the sound ( or turn the music up) as you play. I found the constant grunting of the player to be really, really annoying. Try it for yourself and see. This topic contains 0 replies, has 1 voice, and was last updated by Archivist 3 years, 11 months ago. This is the auto-generated forum topic dedicated to Cadet Training Survival Simulator.